← How Dependent is Japan on Nuclear Energy? 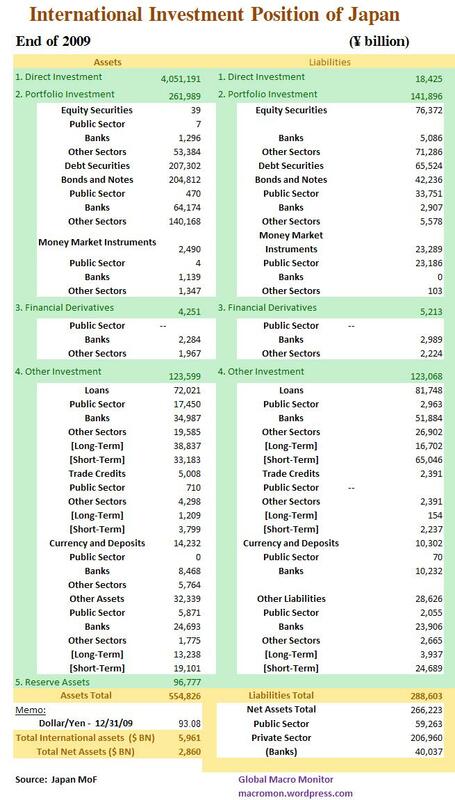 The following table is a detailed analysis of Japan’s international investment position from the Ministry of Finance. Using the latest data is from 2009 and the year-end exchange rate the country held $5.96 trillion of international assets with a net position of $2.8 trillion. In a sharp contrast with its public sector finances, Japan has the strongest net international investment position of any country. This also compares to the negative U.S. net international investment position of $2.7 trillion at year-end 2009 and a major reason why a U.S. Japanese-type deflation scenario is totally flawed, in our opinion. It’s highly unlikely the Dollar will experience an 80 percent secular appreciation in the aftermath of the bursting of the U.S. real estate bubble as the Yen has, in our opinion. On December 31, 1989, the peak of the Japanese real estate and stock bubble, the Yen closed at 143.80 and is now at 82. This has hurt the export-oriented economy and one reason why the NIKKEI is still down over 70 percent from its December 1989 peak. Japan’s strong international investment position is why some believe the country could sell and repatriate some of the assets to finance reconstruction, which would put upward pressure on the Yen. It appears the policymakers have drawn a line in the sand at the 80 level, however, and will do whatever it takes to protect their exporters. This entry was posted in Bonds, Equities, Japan and tagged Foreign Investment, International Investment Position, Japan. Bookmark the permalink.